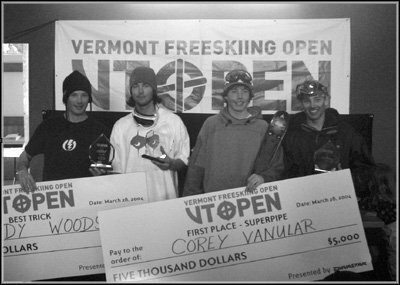 The second annual Vermont Open presented by Dynastar, Freeskier, Smith, Merkley, and Powerbar took place at Stratton Mountain, VT from March 25-28. Last year the Slopestyle and Superpipe events at the Open were the biggest and most progressive events on the East Coast, and even higher expectations were set for this year with a Big Air exhibition of Dynastar team athletes and invited riders added to the hectic schedule. Included in the list of events were a Freeskier welcome party on Friday night and a party at GrizzlyÃ¢â‚¬â„¢s, an on slope bar, on Saturday night. With a list of pre-qualified riders like Dave Crichton, Liam Downey, Andy Woods, Mike Wilson, Tanner Rainville, J.P. Solberg, and Dan Marion, it was obvious that no one was going to be disappointed. The Slopestyle qualifiers took place on Thursday, with the Superpipe qualifiers following on Friday. Following the pipe qualis, Freeskier threw a welcome party for all riders and guests. There were tons of free giveaways from Freeskier, Dynastar, and Smith, along with appearances from DC and Liam. slides from the competitors. Spectators saw everything from switch ons, 270 on, 270 off, switch ups, nose presses, and spins on the box. 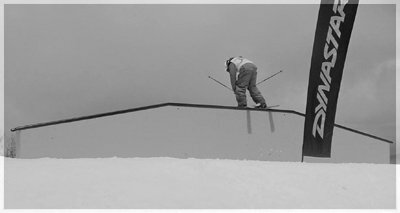 The down slope barrel rail was a true test, with no lip but an ollie-on ride. Not too many people spun onto or off this rail, although there were som some 270 ons, offs, and even DCÃ¢â‚¬â„¢s 450 off. Many riders decided to play it smooth and steezy over tables with regular and switch spins. Those who made it to the finals put together solid runs of regular and switch rodeos, mistys, and corks with a variety of grabs. Charles Gagnier pulled out on top of Dave Crichton for the win, while Tanner Rainville rounded out the podium in third place. Things ran a little late and slopestyle finals went past 2:30 pm Since the Big Air Exhibition was supposed to begin at 3:30 pm and lifts closed at 4:00 pm the event coordinators and riders began to run out of light. However, they brought out some lights, and everyone headed over from the course to the infamous Power Park where the jump was set. Among the Dynastar riders were Dave Crichton and Liam Downey. Nothing big really went down, just some nice smooth corked 5s and switch rodeos. The big air exhibition was called early because of the HUGE party later on that night. Since I was under 21 I could not gain access to the bar, but from what I heard, the party was crazy. Although IÃ¢â‚¬â„¢m sure many riders were hard-pressed to get up early the next morning, the change in weather from cloudy to blue-bird skies got everyone moving. 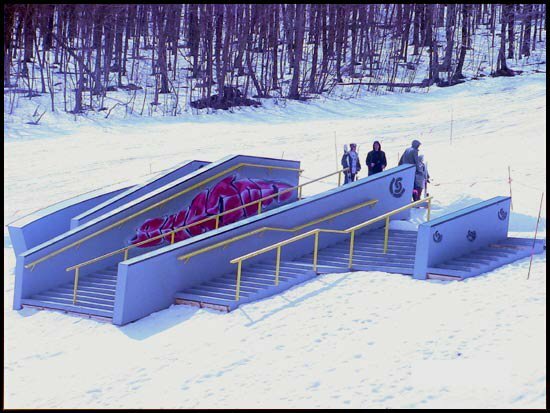 On schedule for Sunday was the Superpipe event, with a newly added womenÃ¢â‚¬â„¢s category for 2004. Riders started their practice runs on the pipe early on, followed by semi-finals and the womenÃ¢â‚¬â„¢s finals before menÃ¢â‚¬â„¢s. Three out of four girls managed both their runs before the menÃ¢â‚¬â„¢s Superpipe final began, but one rider didnÃ¢â‚¬â„¢t quite make it. Instead, Jersey girl Cara Sengebush went out and threw it down in the pipe during the menÃ¢â‚¬â„¢s runs. All the girls put out smooth runs that consisted of some nice grabs, straight airs, and simple spins that showed girls can easy style it too. Ashley Saba took this one home, with Allison Lee in second and Sengebush in third. With infamous pipe riders like podium regular Dave Crichton and up-and-comer Dan Marion of CVA, it was quite a show. DC put down some sick runs with huge first-wall hits, and of course the famous Ã¢â‚¬Å“Crichton flatspin,Ã¢â‚¬? while other competitors picked out smooth unnatural and alley-oop spins. Something all too common yet still impressive were the huge flairs being thrown down, as well as some insanely smooth 10s by sixteen year old Corey Vanular from CVA who ultimately took home the gold. DC gathered another second-place finish, and Colby West rolled into third. Andy Woods also brought home some cash with the best trick. Big thanks to Stratton, Freeskier, Dynastar, Smith, Merkley, and Powerbar for putting this event on, the riders and all other event coordinators too.